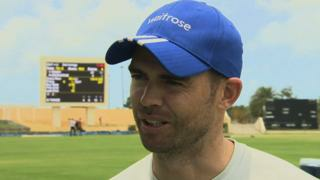 England bowler Jimmy Anderson says "records take a back seat" as he prepares to make his 100th Test appearance against West Indies in Antigua on Monday. Anderson is also four victims away from becoming England's leading Test wicket-taker, but says his main focus is to put the "smiles back on people's faces" and help England recover from a dismal winter campaign. Since the World Cup, Paul Downton has lost his job as managing director of the England and Wales Cricket Board, and England are considering appointing a new director of cricket but Anderson says that decision is out of the players' hands.